Powers/Abilities/Functions: The T-1 is basically a robotic tank, presumably receiving orders and co-ordinating with it's fellows through radio control. It is armed with a pair of large machine guns mounted on it's "arms", and moves on tank-like treads. 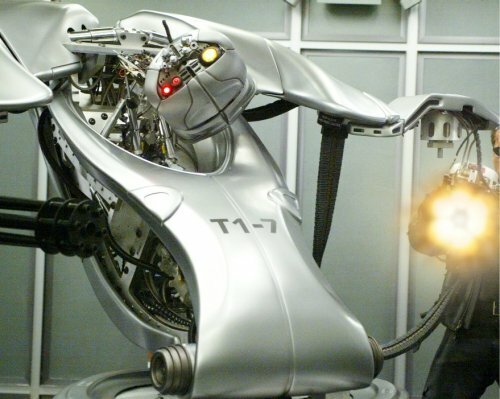 History: A large number of T-1 robots were seen to be assembled at the military base where Skynet was being developed. When the T-X infiltrated the base, it inserted nanomachines into the T-1's, taking control of them away from the human operators. As soon as Skynet was activated and granted access to the internet, it activated the T-1's within the base, which proceeded to roam the installation, killing any humans they encountered. A couple were destroyed by the T-800 accompanying John Connor and Kate Brewster, but the rest apparently finished off the humans and set off from the base to continue their mission. Comments: Some flying hunter-killers were seen, but I'm unsure if these count as Terminators or not (T-2's? ).